Hotel des Halles is located in the centre of the historic heart of Dijon, nearby the Central Halls, the downtown merchant lungs. Hotel des Halles offers direct access to the pedestrian streets, located at 50 meters, in order to wander throughout the UNESCO World Heritage site. City of art and history, Dijon has the 3rd saved sector of France after Paris and Lyon. Dijon gastronomy, Dijon covered market of the Central Halls, Dijon Palace of the Dukes, Dijon antique shops & design, discover the city through cultural and historical landmarks all located within 500 meters of the Hotel des Halles. Our 37 contemporary rooms are completely redecorated to welcome you in a warm and friendly space throughout the year. For solo travellers, for duos and families but also for your seminars, our rooms are equipped with modern devices such as WiFi (Free Fiber) and flat-screen TVs. In our Single, Twin, Double and Family rooms we can accommodate from 1 to 4 people (2 adults and 2 children) according to the chosen category. Our Hotel is also designed to accommodate clients with reduced mobility. 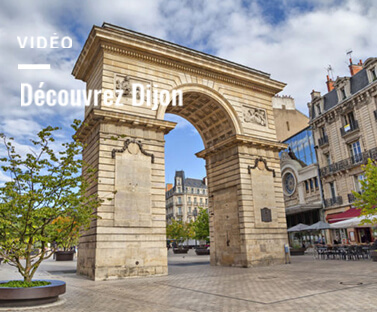 Thanks to a quality location and the parking offer, you will be able to wander throughout the city of Dijon and in particular the pedestrian area. With the public transport network you will be able to move easily and quickly over the whole agglomeration as the Tramway stop Godrans is located at 50 meters from Hotel des Halles. With a wide network of partners, the Hotel des Halles will advise you on a varied gastronomic offer with a large choice of restaurants in the direct neighbourhood. Garnished proposals of elaborate dishes will allow you to fully enjoy your stay. Functional and contemporary, our rooms are perfect for relaxing and enjoying the historical and cultural surroundings. Dijon, a capital of French gastronomy is a beautiful city of more than 150 000 inhabitants. The Hotel des Halles owes its name to the proximity to the Central Halls, the lungs of the Dijon shopping area. All the highlights of the historic heart of the city are within a walking distance and are easily accessible. The hotel being located in the heart of historic city centre of Dijon, all the main attractions and monuments are within walking distance with among others the Cental Halls, the Palace of the Dukes of Burgundy, the Fine Arts museum, the antique district, shopping streets and pedestrian areas at 50 meters. Bientôt une appli dédiée au street art à Dijon ? Où fêter Halloween 2018 à Dijon ? Coupe du Monde 2018 : où voir les matchs à Dijon ? In a unique historic and cultural setting, discover Dijon and the Burgundy region by staying in a 2 stars hotel located in the heart of historic centre and the Central Halls district.